The mango (Mangifera indica) is a tropical evergreen tree that grows best in U.S. Department of Agriculture hardiness zones 11 and 12. The fruit is generally oblong or egg-shaped and may be red, yellow or green when ripe. Mangoes come in more than 400 varieties and may be categorized by what time of year the fruit ripens. The season can vary depending on where the tree is planted as well as the specific growing conditions. The Aloha mango tree (Mangifera indica ‘Aloha’) has a spreading canopy and bears a moderate number of large fruits each year. 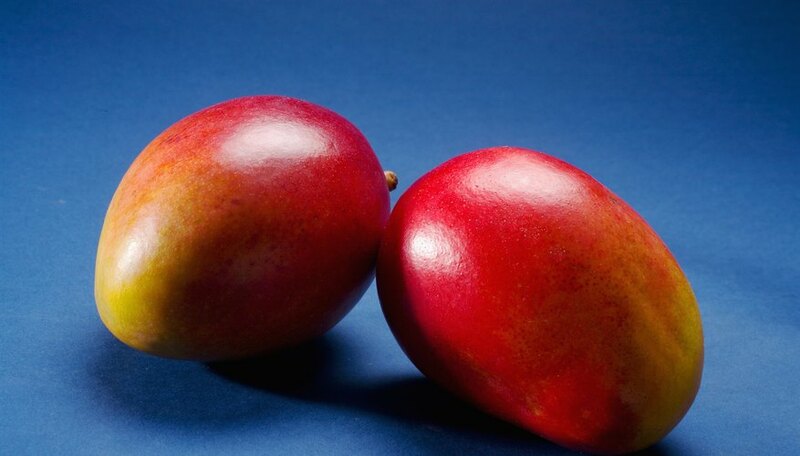 The ripe mangoes are a dull yellow color with an overlay of red. Each fruit weighs about a pound. Zill mango trees (Mangifera indica ‘Zill’) grow relatively large and have rounded canopies with yellowish-green leaves. The fruit has a yellowish color overlaid with a crimson blush. It is oval and about 4 inches long, weighs 8 to 12 ounces and may ripen as early as the middle of May. Sunset mango trees (Mangifera indica ‘Sunset’) are active growers and tend to be upright rather than having low, wide canopies. The fruit is yellow with a blush of bright orange-red and is generally either oval or oblong. It grows to about 4 1/2 inches long and weighs 12 ounces. These mangoes are fiberless and have good-quality fruit that is generally sweet but may have a slight acid taste. Fruit typically ripens in June and July. Tommy Atkins mangoes (Mangifera indica 'Tommy Atkins') are grown commercially because they typically have good color and a long shelf life. The fruit is dark yellow with a red to purple-red blush. It is medium to large and has fair to good flavor, but overfertilizing or overirrigating can cause it to have poor flavor. The fruit has a medium amount of fiber. It ripens anywhere from mid-May through July, depending on growing conditions. Eldon mangoes (Mangifera indica ‘Eldon’) are a medium-sized fruit, 4 1/2 inches long, oval and weighing about 18 ounces. They have pale yellow skins and a tomato-red blush. The fruit is fiberless, sweet and juicy and is of excellent quality. The fruit ripens in July and the first part of August. The trees are moderately vigorous and have dense, upright crowns. Adams mango trees (Mangifera indica ‘Adams’) are moderately vigorous and generally upright. Their canopies do not have a broad spread, making them narrower overall than many types of mango trees. The small fruit is oblong or oval and only 3 3/4 inches long; it weighs about 10 ounces. The fruit is yellow with a blush of crimson. The flavor is sweet and rich. These mangoes are fiberless. The Keitt mango (Mangifera indica ‘Keitt’) is generally in season anywhere from July through September, depending on the growing conditions earlier in the year. The tree has a bit of a scraggly appearance but is a very prolific producer. The oval fruit is yellow with a red blush and has a sweet, rich flavor. Keitt mangoes typically weigh about 20 to 26 ounces, but they can grow as large as 5 pounds. Palmer mango trees (Mangifera indica ‘Palmer’) are vigorous growers with an open canopy, making it relatively easy to harvest the fruit. These mangoes get to be about 6 inches long and can weigh up to 2 pounds, but they tend to average about 25 ounces each. The skin is an orangey-yellow with a reddish blush. The firm flesh inside the fruit has a moderate amount of fiber and a flavor considered to be fair to good. They ripen in July and August. The Sensation mango tree (Mangifera indica ‘Sensation’) is a vigorous grower that has a symmetrical appearance and a canopy that is moderately open. The oval fruit grows to about 4 1/2 inches long and typically weighs about 10 to 12 ounces, but some fruits may weigh up to 20 ounces. The bright yellow skin has a dark, purplish-red blush. Inside the fruit is of good quality with few fibers and a slightly sweet, mild flavor. It ripens in August and September. The Brooks mango tree (Mangifera indica ‘Brooks’) is smaller than most and typically remains a dwarf throughout its life, making it easier to harvest the fruit. The mangoes are medium to large, about 6 inches long and weighing up to 24 ounces. Their skin is greenish-yellow and it sometimes has a very pale reddish blush. The fruit’s quality is good and it has only a moderate number of fibers. It matures late July through October.